Following the publication of a Wall Street Journal article last year, hospital accreditation organizations have received unwanted attention from the US Government. Members of the House Energy and Commerce Committee have requested additional information from the Centers for Medicare & Medicaid Services (CMS) and 4 major hospital accreditation organizations regarding their processes. “The committee wrote in the letters that it is “concerned about the adequacy of CMS’ oversight” of accreditation organizations and the rigor of their survey processes. In addition to the WSJ article, the committee pointed to a 2015 congressional report that found accreditation organizations missed 39% of condition level deficiencies at hospitals that were subsequently reported by state survey agencies in validation surveys. About 90% of U.S. hospitals—or 3,500—are accredited by private organizations. The WSJ investigation found that the Joint Commission, which accredits about 80% of U.S. hospitals, rarely pulls its accreditation. In 2014, the Joint Commission revoked accreditation for just 1% of facilities in 2014. The committee has asked the organizations to provide copies of hospital applications for Medicare accreditation; copies of performance reviews, survey feedback, corrective action plans and responses to those plans; and any correspondence with the CMS. In addition to the CMS and the Joint Commission, the letters were sent to the Bureau of Healthcare Facilities Accreditation, the Center for Improvement in Healthcare Quality and DNV GL Healthcare. The Joint Commission plans to respond to the committee’s request, said Kim McCullough, the commission’s associate director of communications, in an email. The probe “is an opportunity to share more on the work we do to improve healthcare quality and patient safety by facilitating high reliability,” she added. In an interview with Modern Healthcare in December, Joint Commission CEO Dr. Mark Chassin said the organization views denial of accreditation as a “failure.” The commission prefers to work with hospitals to help them improve on deficiencies. The CMS, which is charged with overseeing the accreditation organizations and the state survey agencies, has been asked to provide copies of the most recent contracts with state survey agencies that detail responsibilities for the healthcare providers to comply with certification; any correspondence between state surveyor agencies and accreditation organizations; and copies of any complaints the CMS has received since fiscal 2012 that allege patient harm or misconduct in acute-care hospitals as well as actions the CMS took in response. A CMS spokesman said in an email Tuesday afternoon that the agency will review and respond to the committee’s requests. One possible result of this congressional probe may be that hospital inspection reports will be made public in order to give additional information to consumers regarding their choice of healthcare providers. 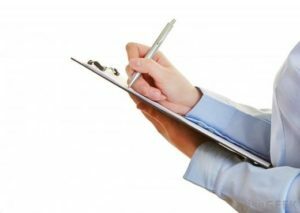 Is your hospital ready for your inspection reports to be made public? To prepare, hospitals have to make sure that they are following all of their detailed processes all of the time. Any breakdown in your processes would be made public via an inspection report, putting your hospital’s reputation and finances at risk. Consider automation tools that help track the processes that The Joint Commission and other accreditation agencies focus on during their inspections. Systems such as iRIScope have been developed to ensure that processes and protocols are being followed since your managers can’t watch over every step of the way. 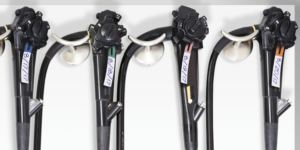 Last week, the U.S. Food and Drug Administration (FDA) sent a warning to all three major duodenoscope manufacturers. The warnings were sent due to the failure of Olympus, Pentax and Fujifilm to comply with postmarket surveillance study requirements set with them by the FDA in 2015. 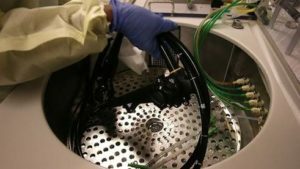 During the FDA’s investigation of duodenoscope-related infections in 2015, they required the 3 major duodenoscope manufacturers to determine whether healthcare facilities were able to properly clean and disinfect the devices. The postmarket studies included two parts – a study to sample and culture reprocessed duodenoscopes that are in clinical use to learn more about issues that contribute to contamination, and a human factors study to assess how well trained hospital staff are following the reprocessing instructions. “To date, Olympus has failed to commence data collection, and Pentax and Fujifilm have failed to provide sufficient data, as required for their respective studies to sample and culture reprocessed duodenoscopes that are in clinical use. Olympus and Pentax also have not complied with requirements for their respective human factors studies to assess how well hospital staff are following reprocessing instructions; Fujifilm has been meeting its requirements for its human factors study. 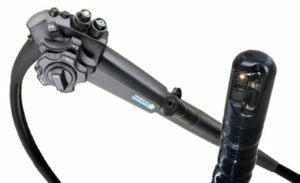 Pentax Medical recently issued an urgent recall of one of its duodenoscope models. 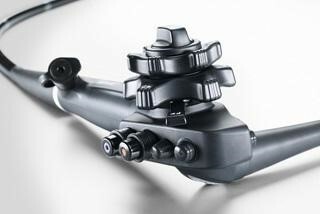 Pentax is informing customers of its voluntary recall of all ED-3490TK duodenoscopes. As part of the recall, Pentax aims to replace the forceps elevator mechanism, O-ring seal and distal end cap. There will also be an update issued to the Operation Manual that recommends annual maintenance. Ultimately, Pentax hopes to reduce the potential for leakage of patient fluids into the closed elevator channel and under the distal cap. The US Food and Drug Administration (FDA) cleared the updated design and labeling for the ED-3490TK on February 7, 2018. Per the FDA, the reprocessing instructions for the duodenoscope model have not changed since the February 2016 update. “The scopes are used in endoscopic procedures, and models by several companies have posed problems for cleaning between procedures. Doctors use the scopes to place small cameras inside patients and perform minimally invasive surgeries and tests. They can be used for things like gallstones, pancreatitis and draining bile ducts. Hang-time limits for flexible endoscopes have been a hot topic among GI, Infection Control and Sterile Processing professionals for the last several years. With no consensus emerging in hang-time limits (sometimes called an endoscope’s shelf life), hospitals are left to make this decision on their own. With different stakeholders within the hospital looking at different guidelines, such as those from SGNA or AAMI, conflicting data may be reviewed before making a decision. Furthermore, since there is no consensus, some hospitals have taken a conservative view of the research and set very low limits, while other hospitals have pointed to the lack of conclusive research and have set higher limits. While these different societies have come to similar conclusions about best practices relating to endoscope reprocessing, finding consensus when it comes to hang-time limits has been elusive. The reason is that the various research papers that have been published on the subject point to differing, though not necessarily conflicting, data points. Some recent studies point out that there is no significant risk of contamination after 5 days of hanging in storage, while others point to no significant risk after 7 to 14 days. As part of our industry research, we have talked to hundreds of hospitals and ambulatory centers about where they have set their hang-time limits. By far, the most common limit we have seen is 7 days (nearly 90% of hospitals sampled). Though 7 days seems to be the most common, we have heard other hospitals using the following limits in this order: 5 days (nearly 10%), 14/15 days (less than 5%) and 30 days (less than 2%). We have also heard some hospitals that have not set a limit because they believe they have such high usage rates of their scopes that they never sit in storage for more than a couple of days before they are used again in a procedure. We do not recommend this practice for 2 reasons. First is that since the hospital is not actively monitoring their hang-time limits, they don’t have any actual data showing how long each scope is in storage between each use. They are using anecdotal data to make decisions rather than making evidence-based decisions. Second, they are making decisions based on the current state of their endoscopy practice. However, their scope usage rates will change over time as their number of scopes increases, their physicians turnover, procedure volume increases or decreases, procedure types go in or out of favor, etc. You have to start measuring this vital statistic, set a reasonable limit and monitor it in order to ensure the long-term health of your practice and patients. It’s inefficient: When using physical tags to track the hang-time limit of each scope, the burden is on clinical staff or techs to check each tag daily to see which scopes are approaching their limit. When you’re tracking dozens or hundreds of scopes in a particular hospital, the amount of time spent rounding each area to check all the scope tags can add up to several hours per week. This is time that could be better spent on patient care. 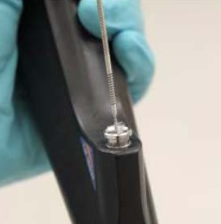 It’s not sterile: The minute you attach a tag to a reprocessed scope, you are putting a non-sterile object on your high-level disinfected or sterilized scope. Whenever someone checks a tag, they put their hands on the tag, and that tag in turn touches your scope. Whatever germs that were on the employee’s hand may have transferred on to the reprocessed scope, adding a non-sterile element into the equation. Surveyors don’t like it: We have heard stories about surveyors from agencies like The Joint Commission who have had issues with these manual methods of tracking endoscope hang time. They point to 2 main reasons why these methods are sub-optimal: a) they require a paper trail, while many surveyors prefer electronic logs and b) they introduce a potentially non-sterile component to your HLD endoscopes. Systems such as iRIScope from Mobile Aspects have been introduced in the last several years to take manual documentation for endoscope management and turn them into electronic records. Using RFID technology, you can now literally have your scopes alert you when they need to be reprocessed. The way RFID technology helps automate endoscope management is both simple and highly effective. Attaching medical-grade RFID tags to your endoscopes allows each scope to be tracked electronically as it goes through the HLD process. 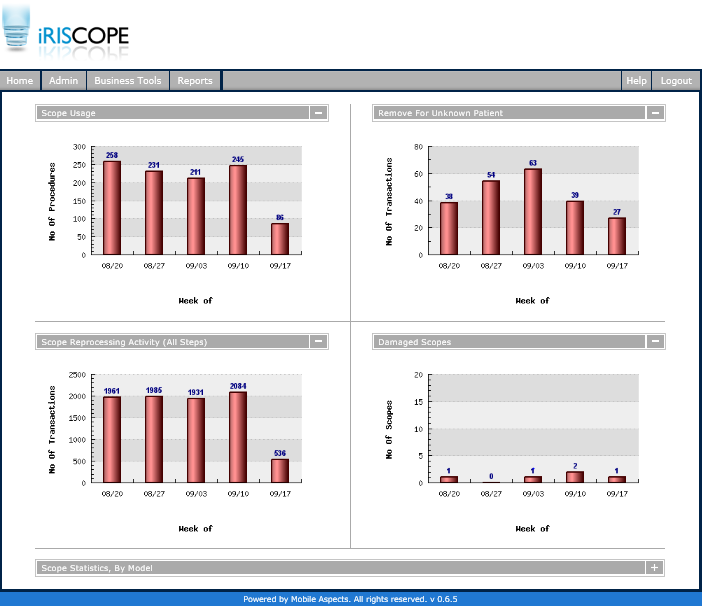 Because you now have an electronic time stamp of each scope’s most recent reprocessing stored in a database, intelligent analytics built into iRIScope will push endoscope reprocessing alerts right to your inbox. No more log books, no more paper tags – just electronic documentation that makes your department more effective and more efficient. All the time staff spends looking at paper tags to see which scopes need to be washed is now turned into time spent on patient care. And patient safety and accreditation likelihood have improved because your disinfected scopes are less prone to contamination. 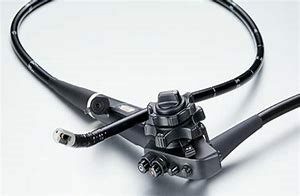 Springfield, Massachusetts-based Baystate Medical Center is notifying nearly 50 patients that a recent colonoscope procedure may have exposed them to a life-threatening illness. 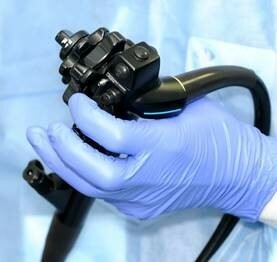 The news was reported by Masslive.com, and continues the trend of endoscope-related safety issues across the US. Noble Hospital, which was acquired by Baystate Health in 2015, was found to have had similar faulty endoscope reprocessing techniques in 2013. In that incident, it appears that a channel of an endoscope model was not being properly flushed leading to potential cross-contamination. In that case 293 patients were notified, and at least one patient tested positive for an infection – not necessarily from the endoscope in question. “Baystate Medical Center has warned 49 patients who received bowel surgery that the colonoscope used in their surgeries may not have been cleaned properly. The problem is that on one occasion a single channel on a colonoscope had not been cleaned properly, Baystate spokesman Keith O’Connor wrote Tuesday in an email to The Republican. 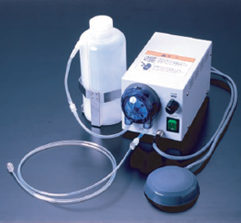 The channel in question carries sterile water used to flush the area of the procedure. The incident is similar to one at Baystate Noble Hospital in Westfield that came to light in 2015. The Massachusetts Department of Public Health has oversight of Baystate and regulates sanitary procedures. ”The Department has been made aware of the situation by Baystate Medical Center and is looking into the matter,” wrote DPH spokeswoman Marybeth McCabe in a statement to The Republican. O’Connor said that in this most recent incident, there has been limited use of the scope in question over the past few years. Baystate has identified the patients involved. Hospital staffers telephoned patients, and Baystate sent letters to the patients on Friday. The involved patients were also given a number to call, a number that the hospital did not make public. This story once again reminds us how important it is to inspect what you expect. The hospital in question has been through similar investigations in the past when its sister hospital was revealed to have had similar challenges in 2016. Without proper examination and verification, the steps that we take for granted every day can be skipped or forgotten by even the most competent staff member. Automated documentation systems such as iRIScope can make the capture and reporting of such steps seamless, while reducing the amount of time sterile processing staff spend documenting their work. Make sure that you work with your team to identify any potential issues in your scope reprocessing workflow, and continue to gather data and provide it back to the team to track their progress to the ultimate goal – 100% patient safety. The first trial accusing Olympus Corp. of wrongdoing associated with contaminated duodenoscopes in US hospitals will be re-tried due to the discovery of new evidence that may aid the plaintiff’s case. The case examines the death of Richard Bigler, a 57 year-old patient who underwent a scope procedure while battling pancreatic cancer in 2013. The plaintiffs alleged that during the procedure, a tainted duodenoscope at Virginia Mason Medical Center passed on a drug-resistant infection that led to his rapid decline and eventual death. “Until now, federal investigations and patient lawsuits into the scope outbreaks have focused more on a warning issued in 2012 by an independent expert who concluded that the scope’s design could allow blood and tissue to become trapped, spreading bacteria from one patient to the next. Olympus emails from 2013, in which executives rejected the idea of a broad warning to U.S. hospitals about possible infections, played a prominent role at last year’s Bigler trial. The company issued a safety alert in Europe in 2013. This revelation comes as a surprise to many that thought that the Bigler trial had been resolved. With the new evidence being presented, the results of the original trial may change, along with the liabilities of Olympus and Virginia Mason Medical Center. In trials like these, documentation of rigorously followed procedures will become a must have for the hospital’s defense. Automated documentation systems such as iRIScope can make the capture and reproduction of such documentation seamless, and reduce the amount of time sterile processing staff spend documenting their work. This documentation can be the difference between successfully defending hospital staff in court and severely damaging a hospital’s reputation and pocketbook by losing a lawsuit related to patient safety.